Manage your account in MyLifetouch and have access to all of your portraits and orders to print through www.mylifetouch.com. Lifetouch studios is always there to capture your child’s wonderful face from kindergarten through their graduation in high school. To have access to this service you will need to create an account. You will be asked to supply information which you can find on your Picture Day fliers or envelope with proof sheet. Enter your Portrait ID number or your picture day ID found on your proof sheet or flier at the designated boxes when you open mylifetouch.com. Then enter your child’s first name to the box below the portrait ID. Then click the “submit” button to get started. You can also find out when is your school’s picture day by clicking “Find Picture Day” located just below the “submit” button. When you have your account you will gain access to all of your child’s pictures where you can order for printing. With your account create all you need to do to access your account again is to key-in your email address and your password which you entered when creating an account in my life touch. For inquiries or questions regarding your account or about mylifetouch services, you may want to visit their FAQ page. The FAQ page answers most, if not all, of you question regarding MyLifetouch. 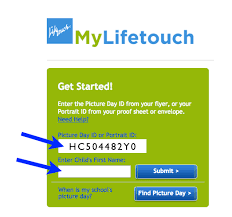 If you can’t find answers to your questions from the FAQ page, you may email them at schoolpics@lifetouch.com.